Love is in the air! Valentine’s Day is one of Chutters’ favorite holidays. Locals and visitors alike travel to our candy counter to pick up homemade fudge and chocolates and scouring the candy counter for favorites both old fashioned and new. Gift baskets for the kids, a box of chocolate for a loved one, and Valentine’s candy for the kids to bring to school for their friends. Whatever the reason, we love the season. The tradition of giving gifts for Valentine’s Day dates back to as early as the Roman era, though not specifically candy. Giving candy on Valentine’s Day began in the Victorian era by Richard Cadbury (yes, like the Cadbury Creme Egg). Fast forward to today, and candy manufacturers all over the world produce delicious holiday sweets for this special day. Is It All About Chocolate? When we think of Valentine’s Day, we often think about a box of various chocolates in flavors like coconut cream, dark chocolate raspberry, caramel, nougat, etc. While we love to follow the tradition, we can also appreciate the other side of the Valentine’s Day candy spectrum. Gummies, hard candy, sour candy, and taffies are just as delicious (and holiday appropriate). 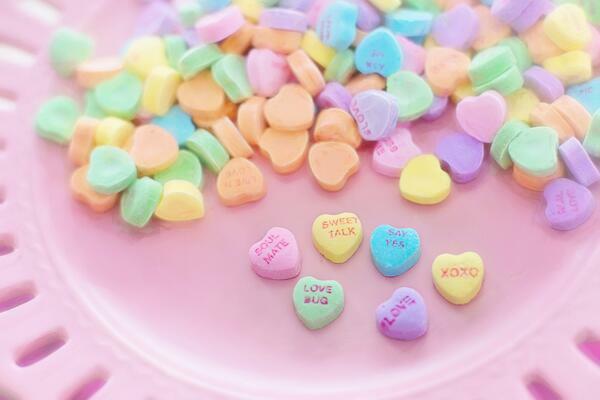 For the candy lover in your life, check out these Valentine’s Day favorites. Gummy fans rejoice! Every year, candy manufacturers make new gummy candy for the day of love. Haribo red and white gummy bears, gummy cherry hearts, Jolly Rancher jelly hearts, sour lips shaped gummies, etc. 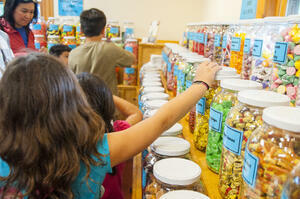 At Chutters, you can find gummy candy year round in all shapes, flavors, and colors. At the world’s longest candy counter, you can make your own personalized Valentine’s Day color candy for all your loved ones. Pick out the red jelly gummy slices, jelly beans to match, and the red sour belts. The world is your oyster! Everyone recognizes the translucent red heart shaped lollipops, the heart shaped red, pink, and white candy that tastes like “runts” candy, and those strawberry hard candies with the soft center. Hard candies have been a candy favorite for decades in cup holder of cars, the candy stash at the office, and in grandma’s favorite glass candy dish. There’s a lot of nostalgia behind hard candy, and it goes back generations. Just like the gummy candy, you can put together a personalized bag of all the candy at Chutters for Valentine’s Day to celebrate love, friendship, and sweet sweet treats. While you’re in town, check out all the Valentine’s Day gifts right on Main Street! 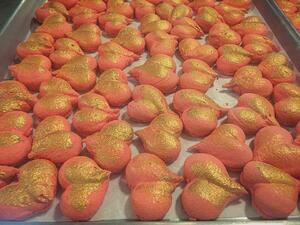 Crumb Bar is a new bakery downtown that has exquisite desserts for every holiday. This upcoming Valentine’s Day, Crumb Bar will be selling strawberry heart shaped macarons and chocolate raspberry cakes (among a few other things I’m sure). They also make fresh and homemade croissants, pop tarts, cookies, brownies, and basically any dessert you can think of. Stop by and grab a Valentine’s Day dessert, you absolutely will not regret it. For Valentine’s toys for your tots, head over to Little Village Toy and Book Shop or bring your kids for one of their book readings! Or buy yourself a new outfit for a Valentine’s night out at Bella Funk Boutique. Spend the night in Littleton and enjoy a fun night of romance. For a more classic Valentine’s date feel, head to The Beal House where you can also book your stay or Tim-Bir Alley. For a fun farm to table brewery experience, visit Schilling Beer Co. for delicious food and extraordinary homemade brews. No matter how you do it, Littleton is sure to help you have a great Valentine’s Day this year.